‘Twas the night before Christmas and all through the home, not a single person was unfamiliar with this poem. 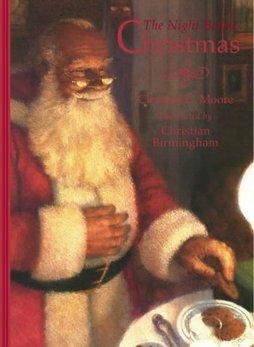 Clement Clarke Moore’s famous poem “The Night Before Christmas” or, as it was originally called “A Visit From St. Nicholas”, is probably well known to a lot of people. If you’re reading this, I’m sure you’re probably familiar with, at very least, its first couple of lines and I think that only stands as a testament to how good it is. The story of the poem is that a man wakes up in the middle of the night on Christmas Eve and sees Father Christmas coming in to deliver the presents. It had such a big impact on the Christmas mythos, including things such as Santa’s reindeers, his connection to elves, the coming down the chimney to deliver presents, the whole element of secrecy and so on. Had this poem not been written, our image of Father Christmas could well be entirely different. The poem’s lovely and it does a good job of reflecting the excitement that comes on the night of Christmas Eve. My particular edition is illustrated by Christian Birmingham and his pictures are really beautiful. The atmosphere set by them is great and I really appreciate the nineteenth century aesthetic. The only problem is that it feels like there should more illustrations than there are. There’s a lot of white space, or pages which just have some very basic visual additions besides the words. Still, whichever version you find, it’s a nice poem which is well worth a read. This entry was posted in Book Reviews, Christmas. Bookmark the permalink.